The primary symptom is a problem with the central vision, which may have dark spots or be blurry and distorted. Peripheral vision is not typically affected, yet when the disease progresses color vision may be skewed. These signs generally appear during childhood and may not present themselves equally in each eye. While some of our Louisiana patients with juvenile macular degeneration retain useful vision into their adult years, others lose their eyesight and experience low vision sooner. 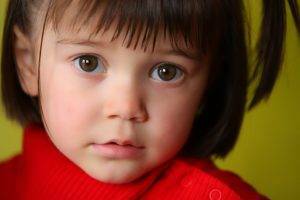 Additionally, kids may also exhibit signs of involuntary eye movement (nystagmus) and misaligned eyes (strabismus). Unfortunately, there is no treatment or cure for this eye disease. However, Low Vision Assistance can help many people to maintain independence and maximize their quality of life. Dr. Wendy A. Waguespack is dedicated to enhancing the lives of people with juvenile macular degeneration by prescribing and offering the most optically advanced low vision assistance available. Low Vision can be very frustrating for patients of any age. When kids cannot read their smartphones, watch TV, or play sports competently, they are at high risk of depression. At our Baton Rouge eye care clinic, we work with each patient individually to recommend the best low vision devices and strategies. We’ll customize your low vision assistance to meet your vision condition, lifestyle and favorite hobbies. Depending upon the unique needs and preferences of the patient, low vision assistance may be provided by telescopes for distance, telemicroscopic eyeglasses for close tasks and/or powerful magnifying devices. In addition to these low vision aids, we may also direct you towards a range of non-optical adaptive devices, such as audiobooks and custom light fixtures. At Dr. Wendy Waguespack and Associates Low Vision Center, we take pride in designing inventive, personalized solutions for each and every patient with juvenile macular degeneration. If you have diabetes, you need to know that having this systemic disease puts you at greater risk of developing vision problems.